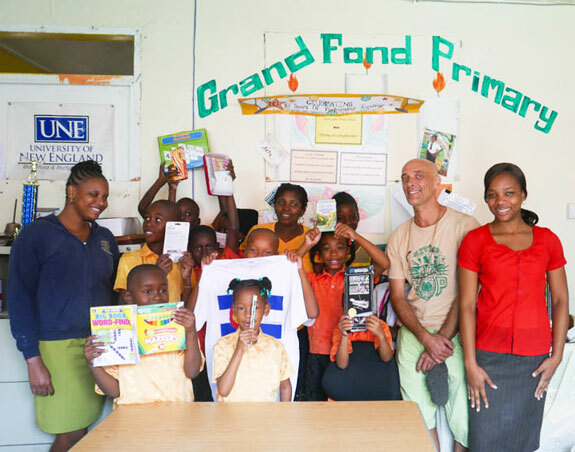 Pack for a Purpose has been truly inspiring for the for the Grand Fond School in Dominica. 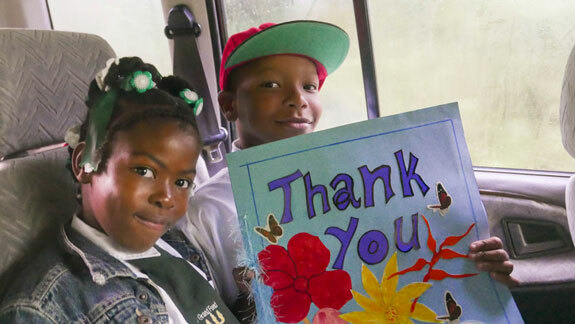 PFAP’s partnership with 3 Rivers & Rosalie Forest Eco Lodge sought to the arrival of around 350 lbs of much needed and extremely useful items for the betterment of the education of the school children in the community. 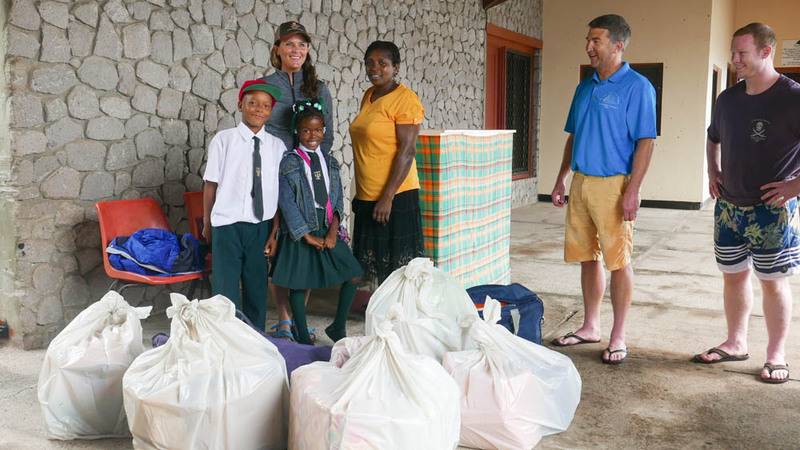 All the high quality gifts received came from two group donations; one from the cruise ship Star Clipper carrying 170 passengers, and the second from a couple of generous & considerate visitors from Salt Lake City. The Star Clipper docked at the Cabritz cruise terminal on March 9th, carrying a bundle of supplies for the Grand Fond School. The cruise, organized by Local Knowledge Travel in the US, was chartered by the American rock group Big Head Todd and the Monsters. All 170 passengers were followers of the band, and more than half of the passengers had donated gifts for the school. One of the passengers, Sarah Lierman, had heard about Pack for a purpose, and mentioned it to Mr. Kevin Clark the organizer. 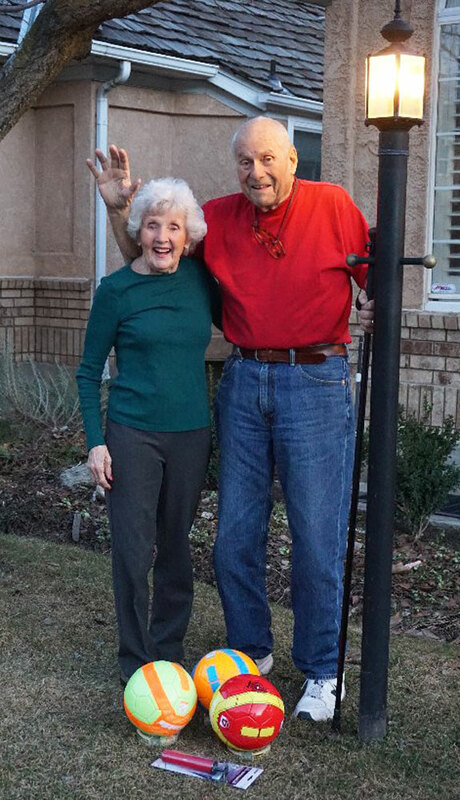 Kevin then contacted Rebecca Rothney, who put him in touch with Jem Winston, managing Director of 3 Rivers & Rosalie Forest Lodge, a long-time member of the Pack for a Purpose family. 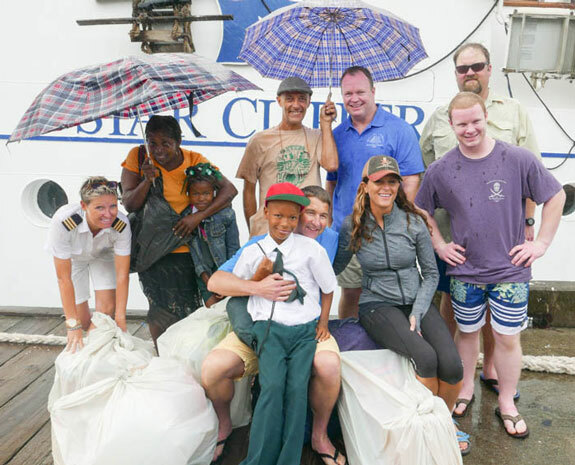 At a presentation ceremony at the cruise berth, over eight huge sacks, approximately 300 lbs of goods for use at the school were handed over. Attending were Miss Matthew, the deputy principal of the Grand Fond School, together with two star students, Mr. Jem Winston, managing Director 3 Rivers & Rosalie Forest Eco Lodge, the crew of the Star Clipper and followers of the band. 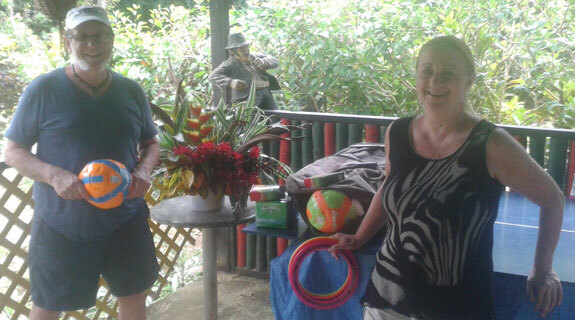 A few days later on March 16th, a caring couple, Ken and Susan, from Salt Lake City, in the US, read about the 3 Rivers Eco Lodge Pack for a Purpose program whilst researching their trip to the Dominica, the nature island of the Caribbean. They rounded up a few friends, including their neighbors Dwight and Nancy, and their dentist Dr. Tucker to donate supplies. They managed to collect around 45 lbs of requested supplies for the Grand Fond School, for use by both the teachers and the pupils. The big heavy sack of items included toothbrushes, pencils, cool educational books, memory sticks, and enough footballs for each team member to have their own soccer ball! The head teacher of the school has come up with an ingenious educational way of distributing Pack for a Purpose donations. All donations are given a points value; and children earn points based on work and behavior. They can choose to use their points immediately for low value items, or save for higher value goods. This teaches them how to budget and save, as well as learning to appreciate your generous donations. The management and staff of 3 Rivers & Rosalie Forest Eco Lodge, together with the staff, pupils, and parents of the Grand Fond Primary School, wish to pass our massive thanks to all the donors involved; Mr. Kevin Clark, Sarah Lierman, Rebecca Rothney, Ken and Susan, Dwight & Nancy, Dr Tucker, the crew and management of the Star Clipper, Big Head Todd and the Monsters, and all the passengers that chose to Pack for a Purpose. We also extend our thanks to the staff and officers at the Cabritz cruise terminal, and anyone else we forgot. We encourage all visitors to the island, including all the cruise ships that stop by, to contact us and see how they can participate in our wonderfully worthwhile and personally rewarding project.